Developing networks of neural systems can exhibit spontaneous, synchronous activities called neural bursts, which can be important in the organization of functional neural circuits. Before the network matures, the activity level of a burst can reverberate in repeated rise-and-falls in periods of hundreds of milliseconds following an initial wave-like propagation of spiking activity, while the burst itself lasts for seconds. To investigate the spatiotemporal structure of the reverberatory bursts, we culture dissociated, rat cortical neurons on a high-density multi-electrode array to record the dynamics of neural activity over the growth and maturation of the network. We find the synchrony of the spiking significantly reduced following the initial wave and the activities become broadly distributed spatially. The synchrony recovers as the system reverberates until the end of the burst. Using a propagation model we infer the spreading speed of the spiking activity, which increases as the culture ages. We perform computer simulations of the system using a physiological model of spiking networks in two spatial dimensions and find the parameters that reproduce the observed resynchronization of spiking in the bursts. An analysis of the simulated dynamics suggests that the depletion of synaptic resources causes the resynchronization. The spatial propagation dynamics of the simulations match well with observations over the course of a burst and point to an interplay of the synaptic efficacy and the noisy neural self-activation in producing the morphology of the bursts. The online version of this article (doi: 10.1007/s10827-016-0634-4) contains supplementary material, which is available to authorized users. This work has been supported by the Ministry of Science and Technology, Taiwan, Republic of China under grand no. 102-2112-M-001 -009 -MY3, and Physics Division, National Center for Theoretical Sciences, Taiwan, Republic of China. Chen, C.C. (2016a). chnchg/cst: common simulation tools. Zenodo. doi: 10.5281/zenodo.163650. Chen, C.C. (2016b). 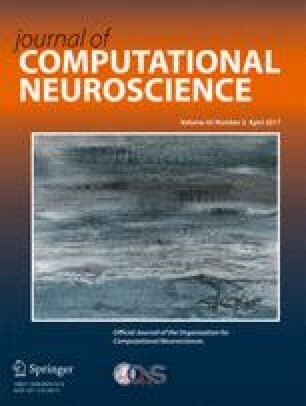 chnchg/measim: simulation of two-dimensional cultured neuronal network. Zenodo. doi: 10.5281/zenodo.166691.